Romance Tokyoïte: Easy&Quick Banana Pie. First recipe posted on this blog is a sweet one. 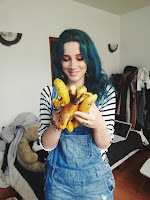 I always buy too many bananas, God knows why, and I end up with black bananas which I don't like to eat, since I like eating my fruits almost green. Bananas are very good for health, yet a bit too rich so I like to lower the quantity of the ingredients used in this pie. -2 spoons of crème fraîche (fresh cream). 2.Then separate two egg yolks, and keep them for later. 3. Then mash one or two bananas. Add 2 spoons of crème fraîche, 150g of sugar, the two eggyolks & 100 g of flour. 4. Mix everything together&pour on pastry. 5. Decorate with sliced bananas. 6. Put in oven for 30mns, at 180 °C(356F? ).